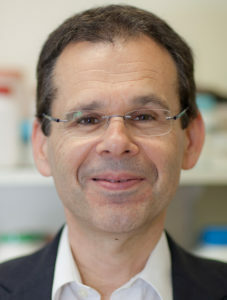 Professor Tony Weiss is the endowed McCaughey Chair in Biochemistry, Professor of Biochemistry & Molecular Biotechnology, and Chair of Tissue Engineering & Regenerative Medicine at the Charles Perkins Centre at the University of Sydney, with conjoint affiliations at the Bosch Institute and Royal Prince Alfred Hospital, and Brains Korea 21 Plus Distinguished Visiting Professor in South Korea. He is a Fellow of seven societies. Professor Weiss is the world leader in molecular studies of human tropoelastin and its assembly to make three dimensional elastin protein biomaterials. He constructed a synthetic gene that enables large scale synthesis of full-length pure recombinant human tropoelastin, quantified its physical properties, led the discovery of tropoelastin’s 3D solution structure, mapped multiple functional sites, demonstrated tropoelastin’s extraordinary elasticity from the molecular to macro scale, discovered direct tropoelastin:integrin interactions and has made a range of sophisticated tissue engineered materials based on these discoveries.